A great general-duty reel, now built leaner and meaner than ever. 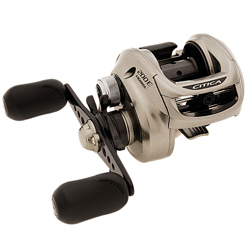 Its compact footprint means the Citica is well-adapted to a wide range of bassin techniques, and the three stainless steel ball bearings are shielded to ensure smooth retrieves in all conditions. Ergonomically designed for comfortable palming. Features an aluminum frame with A6063 aluminum Lo Mass spool; Super Free pinion gear support system; Variable Brake System (VBS); Super Stopper II with Assist Stopper; Dartainium drag. 3 ball bearings, plus 1 roller bearing. "I bought one and have not bought a different reel since. It is well worth the money. I have three of these reels and they all perform great. If you don't want to put down the money for a Curado or other higher priced reels, get this one. Just an outstanding product!" "Exceptional reel. I have the DPV 200 version of this reel, and it's everything I'd expect from a reel costing 4X as much. Smooth as silk when casting, and tough as nails for durability. I'll more than likely be buying another in the near future." "This reel is excellent. It is super smooth for so few bearings in fact its the smoothest reel I have. It has great casting and good drag. I am really impressed with this reel and highly recommend it." "I own this and i paired it with my $34 bps graphite series 6'6" mh fast action and its the things poor fishermen dream of. with some nice 14 lbs mono. this combo would still coast less than $200. so u could still get some new lures. and have a kick as time on the water."